What was your favourite childhood toy? 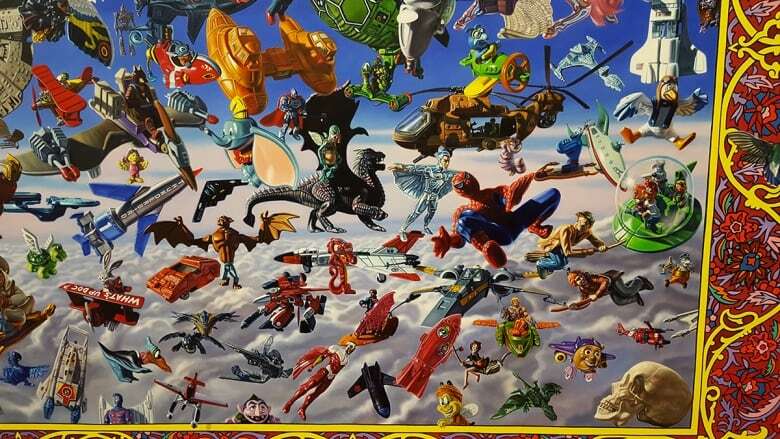 If you grew up in the '80s and '90s, there's a good chance it's been immortalized by Robert Xavier Burden. Was it a Millennium Falcon? A Batman action figure, one whose mechanical punch could knock out the Joker and the Penguin — and every random Happy Meal toy that met its righteous fists? 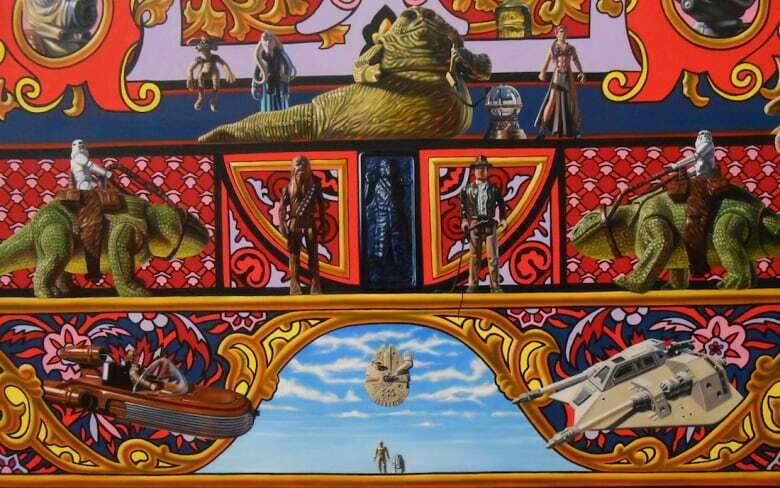 Whatever it is, there's a chance your prized possession has been immortalized in oil paints by Robert Xavier Burden. That chance is especially good if you count yourself a child of the '80s. (Burden, who grew up in the GTA, is in his early 30s.) 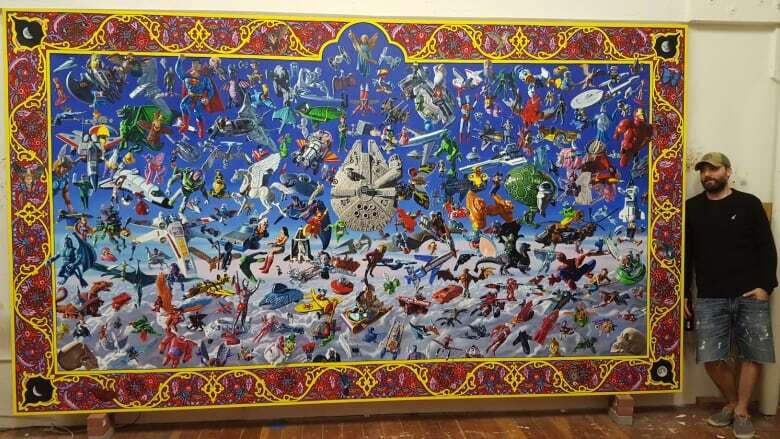 And at a scale typically reserved for European cathedrals, he paints the toys he owned — or dreamed of owning — as a kid, packing each frame with so much detail that it's like seeing a trunk of collectibles dumped out on canvas — instead of the rec-room floor. 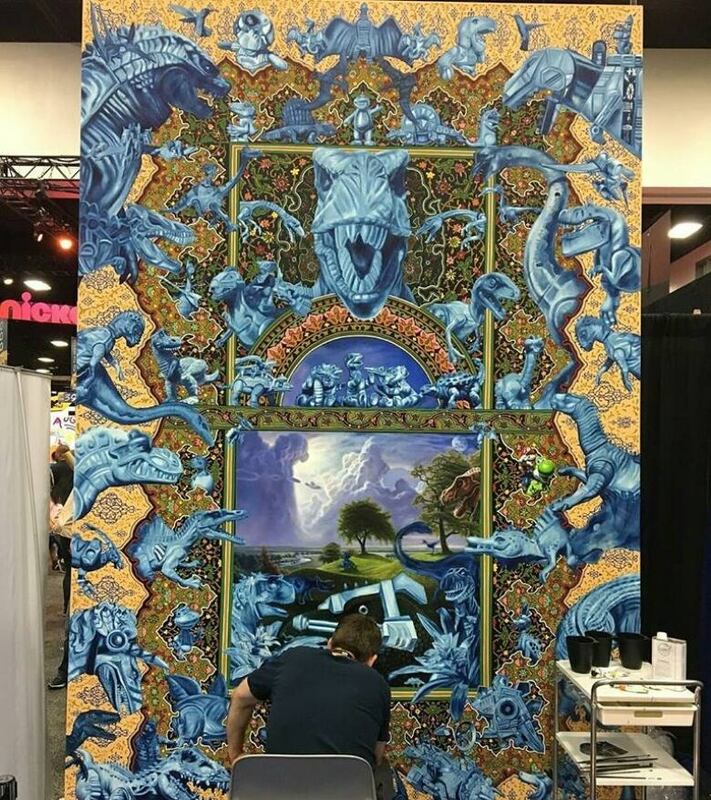 Flightis his latest, an oil painting that extends 14 feet long and 8 feet high. 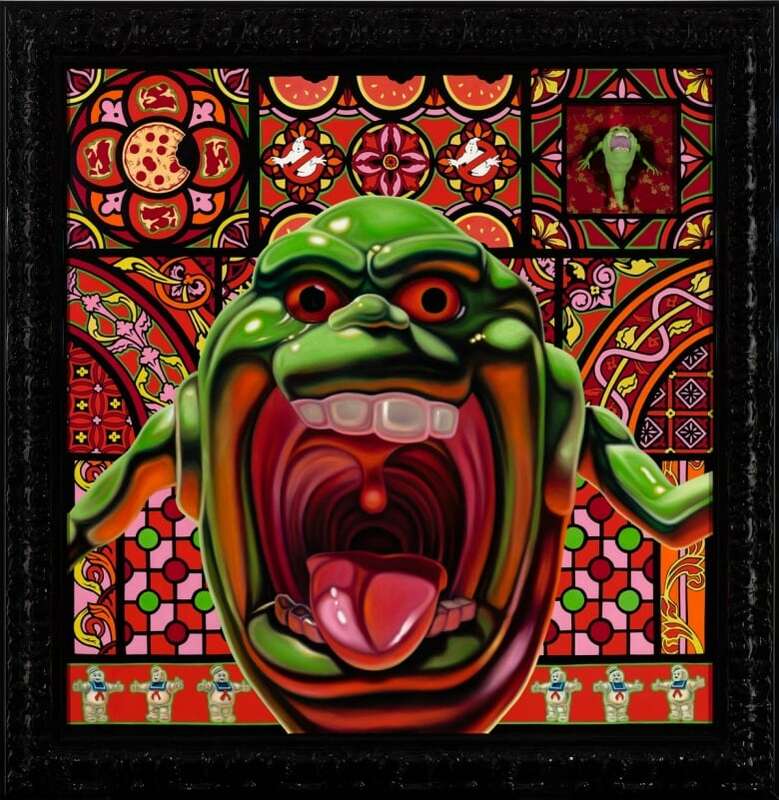 Some 245 characters are suspended among the clouds like God's own garage-sale: Slimer and Sailor Moon and even a Canadian Tire Christmas angel. Nostalgia is powerful stuff. Just think of Netflix's current smash Stranger Things, a perfect time capsule of early '80s sci-fi. Hollywood continues to reboot the favourite kid-friendly franchises of that era, from Ghostbusters to Transformers to Jem and the Holograms. And listicles about being "a '90s kid" will be clickbait, no doubt, for decades to come. But there's more going on in Burden's work than some wistful thoughts of "remember when." Nostalgia is what you feel when you think of something that's disappeared for good. These paintings are meant to place you right in the moment — to make you actually feel, right now, as wide-eyed and full of wonder as you did when you were five, a time when a blob of poseable plastic could be the greatest treasure on earth. "I remember how incredibly awe-inspiring these things were for me as a kid," says Burden. Now based in California, where he did his MFA in painting at the San Francisco Art Institute, the painter teaches at two colleges in the city. In 2006, on a visit back home, he stumbled across a box of his old things — the stash of toys he hadn't seen in years. "They were larger than life, they were like sacred objects, sacred talismans," he tells CBC Arts, "and now I just see them as cheap pieces of plastic." "I wanted to see if I could, through painting, sort of recapture that sense of awe that I had with these things." 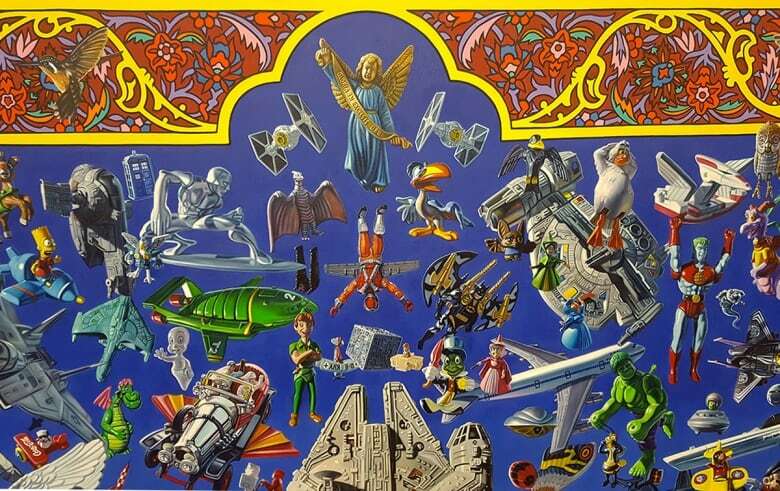 In the older paintings, Burden sometimes built his actual toys into the frame like a holy relic of this or that patron saint of Saturday mornings. "It's not some irreverent comment on religion or spirituality in any sense," he clarifies. The reverence is sincere. 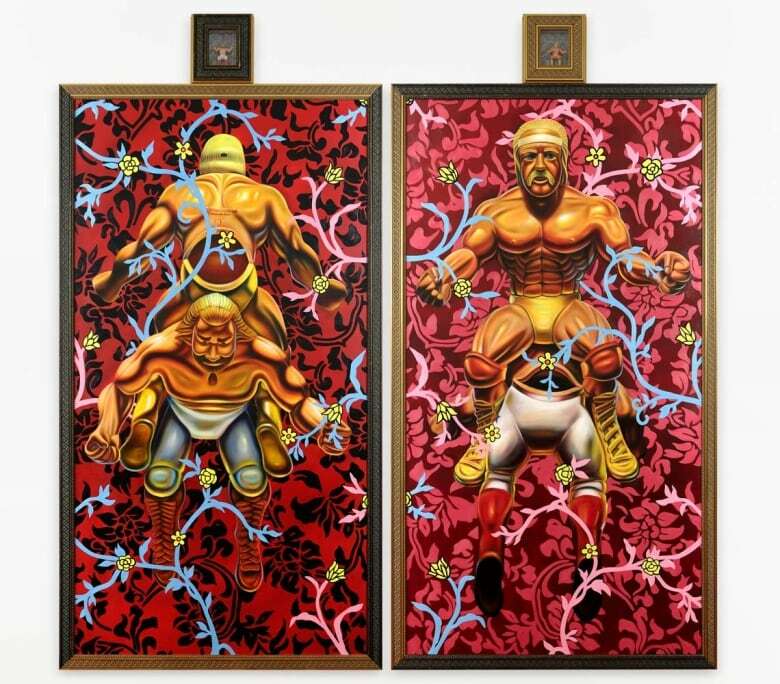 Ten years on, he's still chasing that ideal, as the paintings have evolved into something more elaborate and less autobiographical. Hundreds of figures might crowd a scene — most, if not all of them, painted from real life. 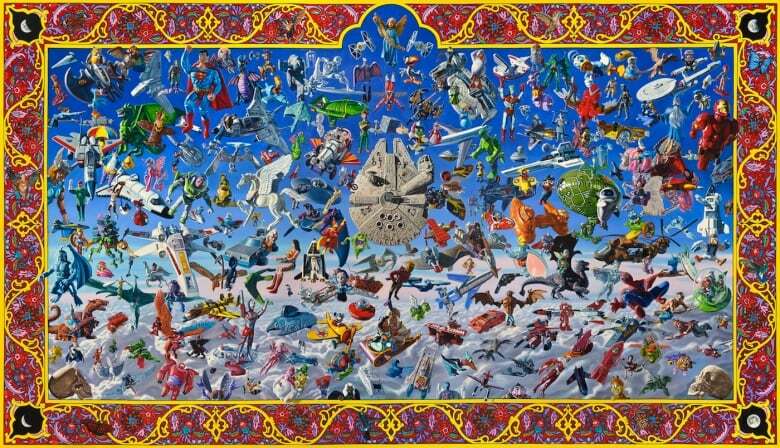 The backgrounds, too, have become more complex, mixing luxurious or sacred aesthetics from around the world — illuminated manuscripts, Moroccan rugs, mandalas. And if the sight of a Ninja Turtle doesn't mean what it used to, the scale of these paintings is a judo chop to the senses. 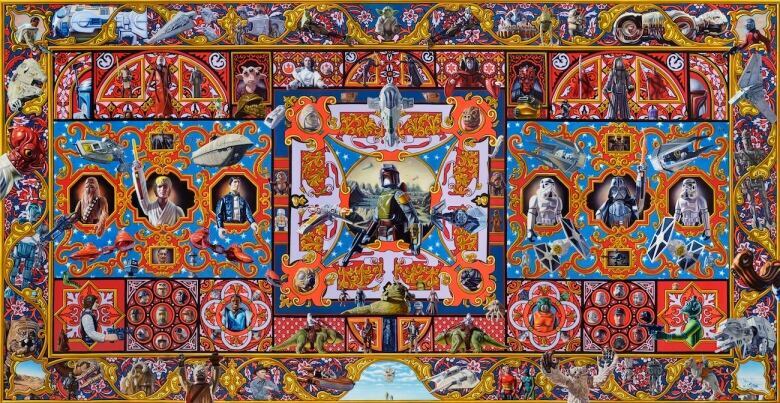 Space Opera, his 2015 meditation on Star Wars (which has been called the largest painting ever dedicated to the franchise) is a visual saga incorporating every original toy from the first trilogy, with a few extra footnotes thrown in. 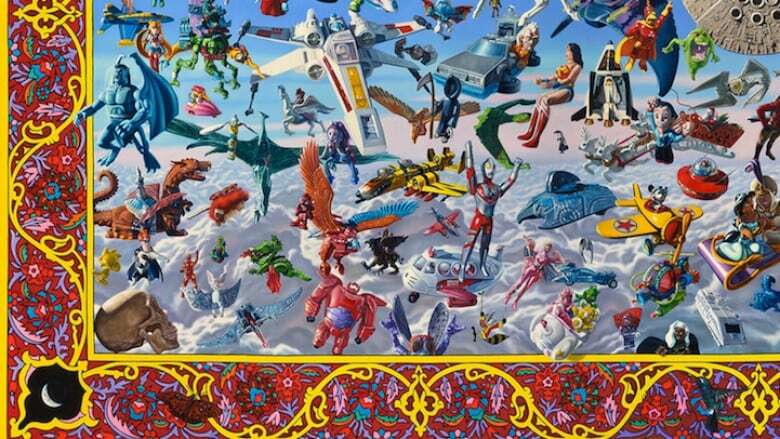 He's currently working on 12-foot-tall panel featuring every dinosaur in modern pop-culture, from the Toronto Raptors to Baby Sinclair — and it's just the first part of a triptych. "It's the painting that I've been dreaming about making for 10 years," says Burden. 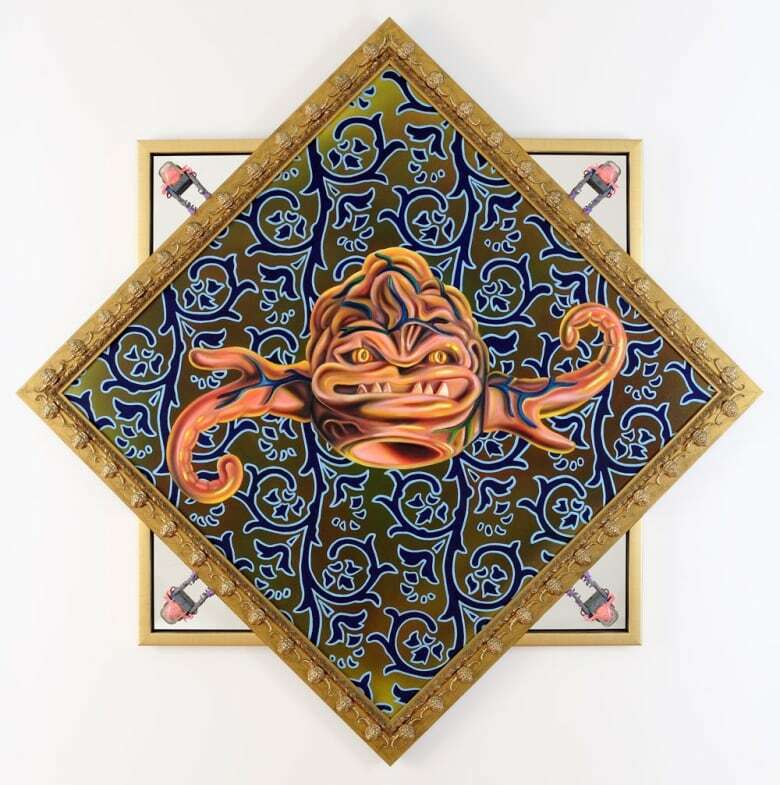 "It's not just about a love of toys, it's about making a devotional object," he explains — and that means the painstaking act of producing these pictures is a major part of the art itself. 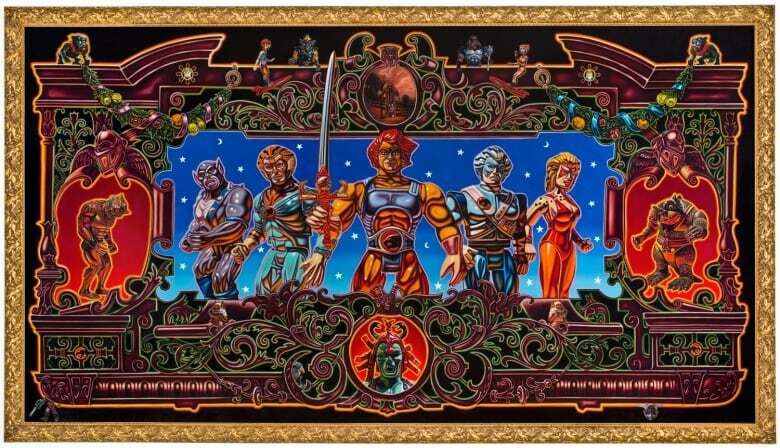 He can spend 18 months on a single painting, never mind the decade already dedicated to this series. "To me, devotion is about labour and putting time into something," he says. "It hearkens back to the great sacred paintings of the Renaissance era and the Baroque era and the Mannerist era," he continues. "I guess I'm trying to be a part of that tradition a little bit — not that I would ever put myself on that level." "But I do believe there's something special about a hand-made one of a kind object," the sort of thing you have to experience in person. "I do believe there's something special about oil painting, specifically." It comes with a special sort of challenge, too — namely, getting the work seen and sold. Pokémon Go is invading Canadian museums, so how are they responding? "This isn't social-media savvy, it's not Instagram-friendly," Burden jokes. These are paintings that demand an audience IRL — sucking in passersby as they pore over details, spending more time with the pictures than anything that might appear in a social feed. To get his work in front of more people, Burden brings the paintings to fan conventions when he can. At a 2015 Star Wars event in Anaheim, his Space Opera got an audience of devotees that included The Force Awakens' director J.J. Abrams. And since 2014, he's shown select pieces at the fanboy mecca, San Diego Comic Con. Burden spoke to CBC Arts the day after returning from this year's edition, where he was on the floor painting his dinosaur piece. 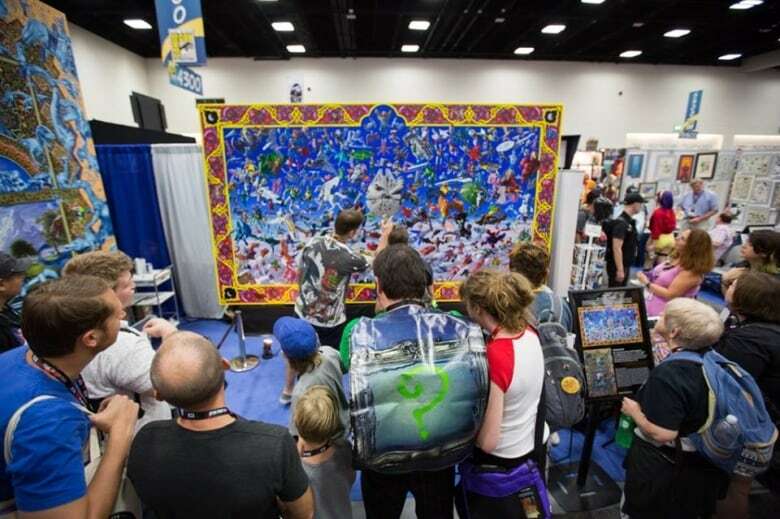 Live painting is a new tactic for him, and he says he hopes it helped the work stand out from the con's onslaught of visual stimulus. 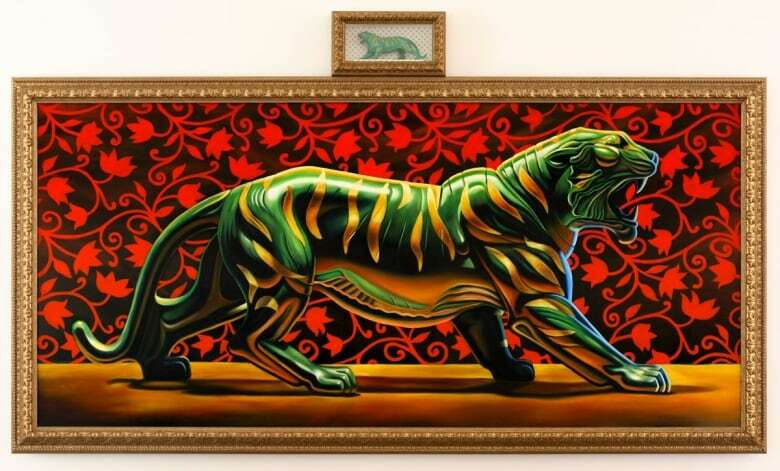 "It's extremely unlikely that someone walking the floor is going to say, 'Hey, that's a $150,000 painting. I'll take it!'" Burden jokes, but he keeps returning for the "massive, loving audience." 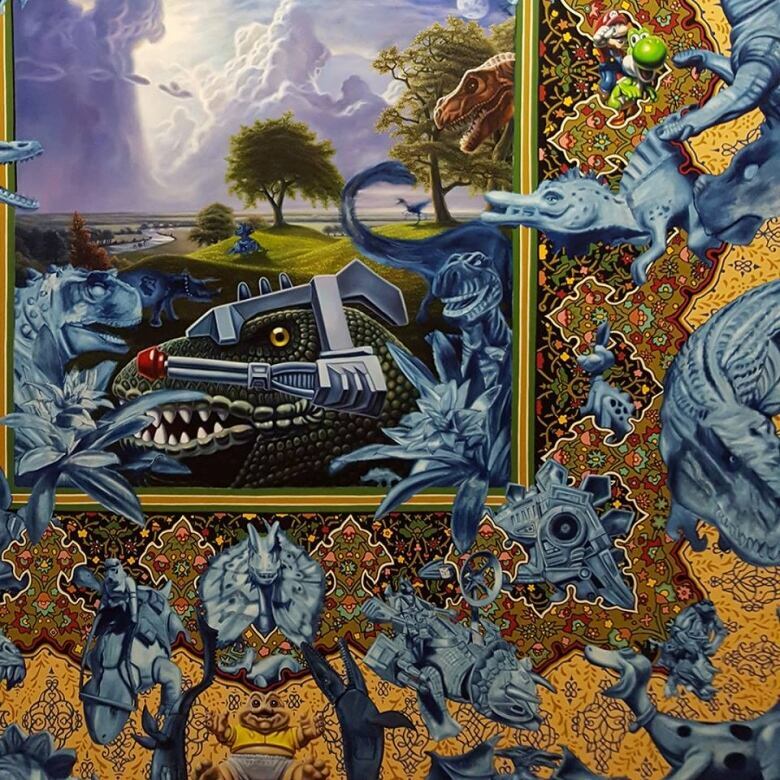 "I think one of the most difficult things about what I'm doing is that I'm making extremely ambitious paintings that don't really belong anywhere," he says. 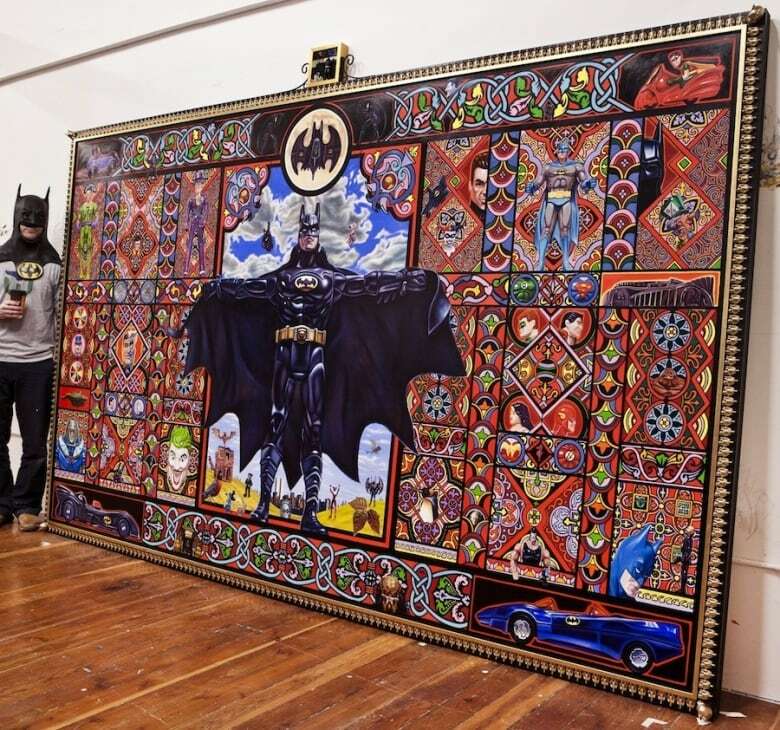 It's because of the size and the pop-culture subject matter, he speculates. "I mean, they're essentially too high-brow for the low-brow scene and they're too low-brow for the high-brow scene." But that's not a reason to stop. The series will end at some point, he says, but not in the foreseeable future. 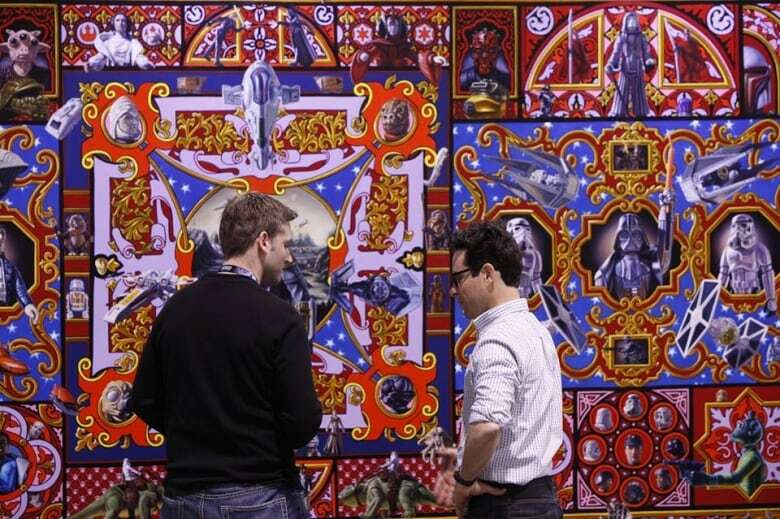 "I've made 20 to 25 large-scale works over 10 years and that's not really that many. I have at least 15 more that I dream of making before I'm done," Burden says. "It still might be another 10 years before I have this series worked out of my system."